No one would have expected that the Inca empire, called Tawainitsuyu, has all in all ruled the Andes for as little as 100 years. Their huge empire has historically fallen because of an epidemic of smallpox brought to their world be early visitors of Europe (mainly Spanish), the civil war between Atahualpa and Huascar, the last two Sapa Incas, and last but not least, the conquista of the Spanish invaders. We will focus on the events which led to this sudden downfall of the Incas. Three individuals play a crucial role: the two half brothers Atahualpa and Huascar and the Spanish conqueror Francisco Pizarro. The latter has changed more in our world as we know it today as Napoleon and Hitler did. 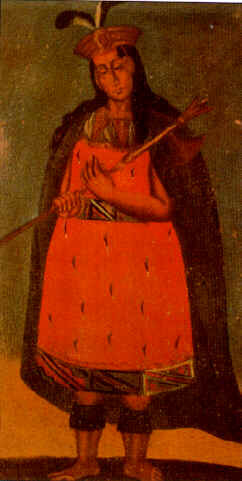 Pizarro was a simple soldier in campaigns in Spain and Italy. The taste for adventure has never left him and he had an unusual amount of guts as we will see later. Ten years after the discovery of the New World, Christoffel Columbus decided in 1502 to put Pizarro on his wish list of fearless soldiers to join him in his expeditions. Small civilisations at the coasts of Mexico and Venezuela told the Europeans that there exists a land in southern direction, over the mountains and forests, that was so rich and powerful that walls were made of gold and that their leaders lived in big pallaces. Pizarro, hoocked on his gold feaver and wanting to be rich and famous, stayed first a couple of years on the island Hispanola where he battled for the first time with indianen (the current Haïtians) and with his companion Vasco Nuñes from Bilbao, they settled in panama in 1513. There he became a large land owner and a rich citizen. Yet the tales about the country of gold continued to haunt his mind. He exchanged local products what with the local indians in exchange of gold. Rather by coincidence the tales concerning the Inca land were confirmed. During an excursion to inspect new lands on a Spanish galleon at the South of Panama he encountered a raft with some crew. For the first time he saw material proof of the wealth from that unknown country in the south. The men carried a lot of golden and silver objects and jewels as well as gems. From head to toe these people were so overwhelmingly decorated that he decided in 1524 to undertake a first difficult and a little interesting expedition. A second followed two years later brought him in contact with six nolblemen on a raft who were travelling with their goods. Three men were captured and learned to serve as interpreters. Wisely he let go of the other three men. Only 13 of his men had the courage to continue the expedition. The others returned or died because of sickness and exhaustion. In 1527 Pizarro met the inhabitants of Tumbes, at present the most northern city of Peru at the border with Equador, then part of the Inca empire. The strangers dressed in suits of armor were welcomed in a friendly way. Again the Spanish heard stories concerning the tremendous wealth of the rulers up South where there existed replicas in gold of corncobs, shepherds in pure gold, the many amazing temples with walls of gold, their powerful leader called the Sapa Inca and their god the Sun called the Inti. Gold had no intrinsic value to these people as it is the case for the Europeans. Gold is the sweat of the Sun and silver the tears of the Moon. These noble metals were honoured as a holy relics and thus treated this way. Pizarro's hunger for gold became without boundaries. He made up a plan to form a little army and to conquer this land of the Incas under the Spanish flag. But it didn't develop as smooth as he wanted however. It took three years before the king of Spain Karel V approved the necessary soldier for Pizarro's adventurer and before he was ready to return to the New World. Pizarro could only get 200 heavily armed soldiers, also because the king was not entirely persuaded of the truth of Pizarro's story and because the kingdom was short of money and no more resources could be spend on Pizarro (caused by the war with England). With the promise he could become city holder as a stimulant to conquer these new lands, Pizarro and his men arrived in 1532 in Tumbes. He had to wait a long time, but he would quickly realize that this delay was a in fact triumph. What happened in those three years only played in his advantage: there has been a civil war that divided the Inca-armies who now stood in front of each other on one side Inca Atahualpa in the north and Huascar in the south. On top of that, Western virusses such as small pox and the flue did their destructive entrance in the New World and sowed dead and destruction under the population, even at places where the Europeans didn't go yet. The tragedy of the fall down of the Inca empire had started and their power briefly became soon nothing more than a myth. The post is very good indeed but it is hard to reference it as it lacks many essential information such as author, date of release, bibliography. im trying to take a test and i wanted to look up the ansewer but could not find it! its ok but its alot 2 read. This is ok. It's a little difficult to understand though. this site is cool i was just learning about the incans i will recomend this to every one. This web site is sweet!!! I just learned about the inca in school and I'm writing a report. This site helped my research a lot! !